The Punch Regios is the 3rd Limited Edition cigar from 2017, along with the Partagas Serie No.1 and the Cohiba Talisman, a powerful Habanos. • Perfect construction and a great potential for ageing. Like all the Limited Edition cigars, the Punch Regios de Punch is rolled with some 2 years tobacco leafs. As a result, the wrapper is of a nice dark brown color. The cigar appears rustic, the wrapper is toothy and some small veins are apparent but the overall construction looks great. Great aroma upon opening the box. At cold, the wrapper emits scents of leather with touches of citrus. The Regios de Punch leaves some sugary notes on the lips with the distinctive Cuban twang as well as some bitter nuttiness. The cold draw brings some flavors of wood, some char-grilled notes and still the hints of citrus. The draw is spot-on from the get-go, and the burn is never troublesome. The ash builds-up nicely past the inch mark in beautiful dark grey rings. The draw remains good throughout the rest of the cigar, with just the right amount of resistance. 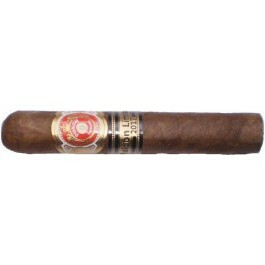 The Regios de Punch starts off unexpectedly creamy and mild, which is unusual for a Punch cigar. There are flavors of wood, leather with some floral notes and some spiciness as well. However after the first few puffs, the cigar picks up in strength and quickly settles above the medium mark. The overall flavor profile is very well balanced, now dominated by the leather, the strong cedar and a good amount of roasted espresso. The cigar emits a thick white smoke which has notes of black pepper and vanilla, making the whole experience very pleasant. Once the ash falls off after an inch, the Regios de Punch reveals a perfect slow burning dome. The flavors are still very creamy in the middle section, now with the additional hints of nuts and almonds, some orange zest, pepper and and ample toasty earth notes. The cigar is overall a bit sweeter, but the strength is still well above the medium mark.